Here's one of mine, a Small Wonder Labs SW-20 built from a kit, with a homebrew end fed half wave antenna tuner (notice how it magically floats in midair due to the light wire antenna) Have worked the world with this little 2 watt wonder ! I'm not a "QRP guy" but that is a nifty setup. When I get my tax refund next year I'm toying with the idea of picking up a Yaesu 817D and seeing what I can do. I already have some portable antennas so I could probably put something together easily. The TV table is a nice touch! Not exactly a QRP rig but I do run my Icom 706 on low power all the time. Its in my GoBox. You'll be surprised at what you can do with QRP, especially if you use CW and PSK. I've worked the world with 2 watts and simple wire antennas ! BTW, I have an FT-817 and like it really well. But do yourself a favor and get a good filter for whatever mode you want to work as the RX is a bit on the noisy side. Also, get a good high capacity battery pack for it as they are somewhat of a current hog. Cool station ! 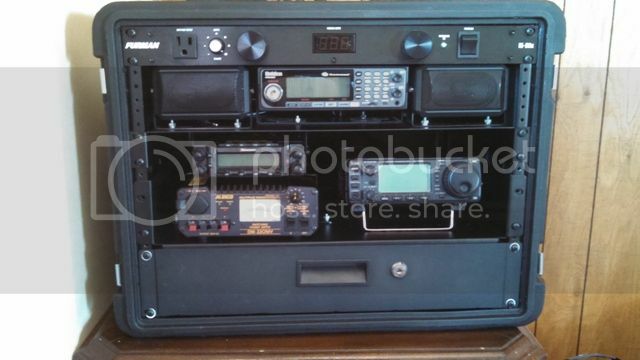 Been thinking of doing something like that with my Icom 703 ! or if the ability to just pick up the entire thing and leave a location quick (as in like what you do when a fire in on the way) will be worth it even if the setup time is more.